Here is the full transcript of life coach Dr. D. Ivan Young’s TEDx Talk: Emotional Intelligence: Using the Laws of Attraction @ TEDxLSCTomball conference. This event occurred on October 30, 2015. To learn more about the speaker, read the full bio here. It’s really good to be here, and I want to first acknowledge these students, because this is not easy when you’re a student. It’s not even easy when you’re a professional. So can we give these guys a hand? Thank you. I’m here to talk to you about two things that you would think just do not go together. Those two things are emotional intelligence and the laws of attraction. I was talking to Dr. Thomas the other day when I came for the rehearsal and he said, “Well, Doc, emotional intelligence — isn’t that being aware and having clarity about your feelings and the feelings of other people when you’re in the midst of a set of circumstances or a situation with them? And I said yeah, that is definitely a definition for that and a very accurate definition for that. But the truth about emotional intelligence goes far beyond having just clarity about people. It’s clarity about situations, circumstances — why are you there? When you stop and think about, I’m in this situation, I’m in the midst of something. Now what is that something and more than likely that something is a set of circumstances or a dilemma you may have encountered that you attracted into your life. And that’s where the laws of attraction come to meet emotional intelligence. Like attracts like. These things that you expect come to you. What we believe is that if we say some affirmations, if we take a moment and visualize something, do a vision board or something of that nature, that’s what’s going to happen but not true. As a matter of fact, if I say right now, do not think of a chimpanzee wearing a red tie and a blue and white pinstripe suit whatever you do, do not picture this chimpanzee wearing this red bow tie and this blue pinstripe suit, what do you keep thinking of? 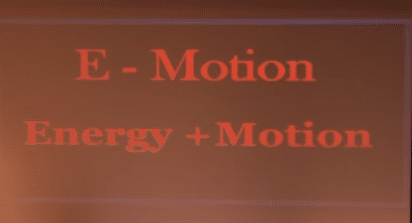 The very thing that I told you don’t think about, because that is where you are putting your E – Motion – that energy plus motion and the more emotion you pour into anything, the more of that thing you receive. In other words, you can say one thing and do another. And as we well know many of us typically say all the right things but do we do them? If you don’t believe me go to somebody’s house and look at all the dusty workout equipment; look at all the diets that they tried; go to a gym and look at the people that signed up that are no longer coming, because what we have done is we’ve taken the laws of attraction and mis-applied them. We don’t take serious the things that we feel we deserve enough in order for them to manifest into our lives. Real simple. Monitor what you feel. 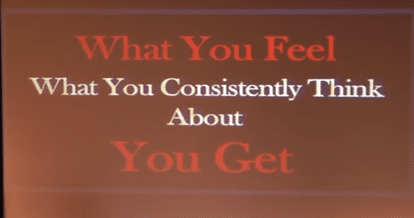 What you constantly think about, that is exactly what you get. If you keep thinking, I’m — my luck is never — everybody gets it but me. I’ll never have that. I’ll never live in that house. You know, that’s for them. Whoever them are those people are… when you constantly think about — how much bills are, what do you end up with? More pink slips, more bills. When you constantly think about, I don’t want to gain any more weight, or I don’t – I need to lose — you know, lose some of these bad habits that I have. I want to stop smoking. I’m not going to smoke.